OXFORD, Miss. 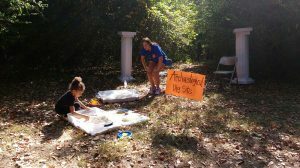 – The University of Mississippi Museum is hosting its latest “Let’s Move” Family Activity Day this weekend. The drop-in event is set for 10 a.m. to noon Saturday (May 5) and will combine art and nature throughout the activities, designed for children of all ages. The event is free and open to the public. Children will get to participate in artistic activities and explore nature along the Bailey’s Woods Trail. “We hated to have to cancel in the fall due to rain, but we are really looking forward to using our imaginations to travel around the world as we explore the trail,” said Emily McCauley, the museum’s curator of education. The museum has partnered with RebelWell to provide free Oxsicles, healthy frozen treats made with fresh ingredients and sweetened with honey, to the first 100 people to arrive. The theme is inspired by the Let’s Move campaign launched in 2010 by first lady Michelle Obama to combat childhood obesity. The museum has been participating in the initiative since 2011, using interactive exhibits and outdoor spaces to engage children. A parent or guardian must accompany all children during the program. The museum’s Family Activity Days are sponsored by Baptist Memorial Hospital-North Mississippi and an Ignite Ole Miss crowdfunding campaign. For more information, contact McCauley at esdean@olemiss.edu or 662-915-7073.